It’s always fun seeing what’s new on my trips back to California. Usually a few months go by between each trip, and so it’s a bit easier to detect emerging trends since I’m not the frog slowly being brought to a boil, so to speak. On this trip back, there was a lot of buzz around Hawaiian food and Middle Eastern food. Hawaiian food has always kind of been around in California, with Hawaiian plate lunches (tonkatsu, macaroni salad, etc. ), and of course the recent worldwide boom of poke. 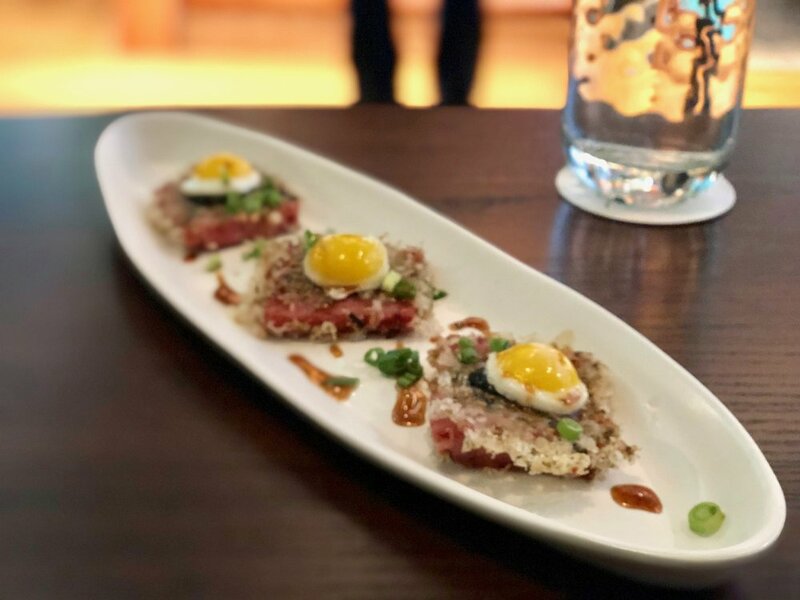 Recently more upscale and modern restaurants have opened up, showcasing a more expansive view of Hawaiian food - with higher prices in tow. One of these new restaurants is Trailblazer Tavern, located within the new Salesforce building in downtown San Francisco. The entrance is right through the main lobby. Now, I had the hardest time remembering the name of the restaurant, even after dined there. I remember the “Tavern” part, but then when I search for the first word I always come up with “Tropical Tavern.” My sister informed me that “Trailblazer” is actually what Salesforce calls its customers, since their ethos is that they can help anyone become a trailblazer. So the name fits. I also learned that Salesforce calls its employees “ohana,” or family in Hawaiian. So I guess it’s extra fitting that a Hawaiian restaurant is in their building! The ambiance certainly helped transport me to a more, well, tropical, place. I came here with a friend who kindly let me use a drink coupon she received from a friend who actually worked at Salesforce. They had a fun cocktail menu, and I ended up with their “Nobody Touches the Mango,” which featured vodka, mango, green curry, lime juice, assam syrup, and orange bitters. There was an astericks that said it contained shellfish. A cocktail containing shellfish? We later reasoned that the green curry probably had some dried shrimp in it. 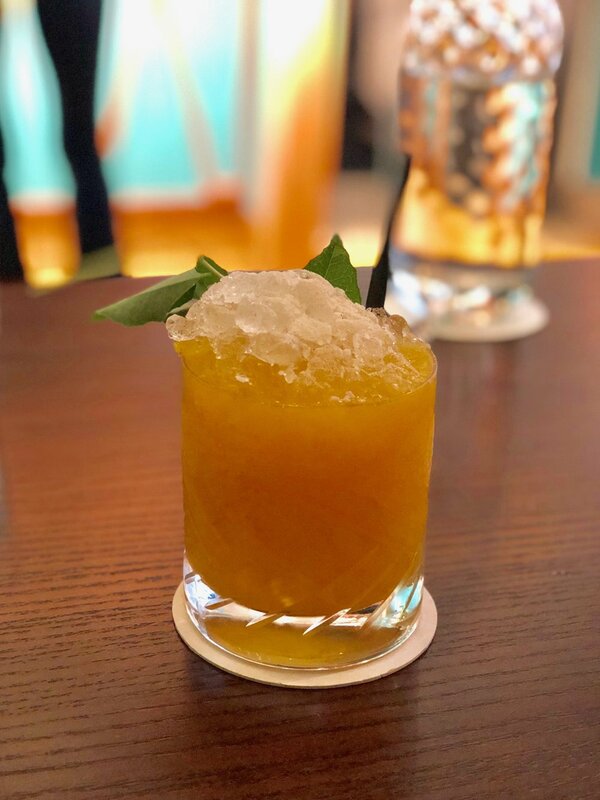 I quite enjoyed the cocktail - sweet with just a light kick, and more refreshing as the ice slowly melted to thin out the concoction a bit more. For an appetizer, we ordered the S.P.A.M. Musubi, their version of the spam sushi. The menu describes it as “Mochi-Crusted Smoked Pork Arabiki Meatloaf,” so the mochi crust gave it the rice aspect, and that meatloaf was the spam. This was topped with a soft dollop of seaweed, and a fried quail egg. These were absolutely delicious! The meatloaf and egg yolk gave rich creaminess, and the mochi gave a light crunch, and that seaweed peeked through it all to complete the sushi essence. This was my favorite dish. Next we had the Mochi-crusted fish. It was good - a bit sweet with the sauce though. I believe this should have come with a pasta, perhaps somen noodles, but they served it with rice because my friend eats gluten-free. I will have to say that while the service was extremely friendly, the accommodation for the gluten-free dietary restriction was a bit strange. When I made the reservation, they actually already asked if any guests had any food restrictions, and so I had already advised about the gluten-free issue. But that message wasn’t relayed to the waitstaff, which wasn’t a big problem in itself. When we asked the waiter which items were gluten-free, he didn’t know, which isn’t really a problem in itself either. But then we had to ask him to check with the kitchen for each appetizer we were interested in, and then had to repeat the process for the main courses. It ended up being a very long process. And his first reaction to our wanting to find out if the S.P.A.M. Musubi was gluten-free or not, was that it wasn’t, because of the mochi. Um, mochi is rice, which doesn’t contain gluten. So I suppose when it came around to ordering the Mochi-crusted fish, perhaps they already ran out of patience and simply substituted whatever side was supposed to have come with it, so just served up a bowl of plain white rice with it. I would have of course preferred that we been advised that this dish wasn’t totally gluten-free, and would we be okay with that substitution. Finally, we had the “North Shore-Style Kauai Shrimp,” with “Garlic Butter Sauce, Edamame, Carrots, Short-Grain Rice.” So yes, one more dish with white rice. This one I would pass on next time. The shrimp were nicely prepared, but there was too much of a buttery taste, with that buttery sauce flooding the rice underneath. 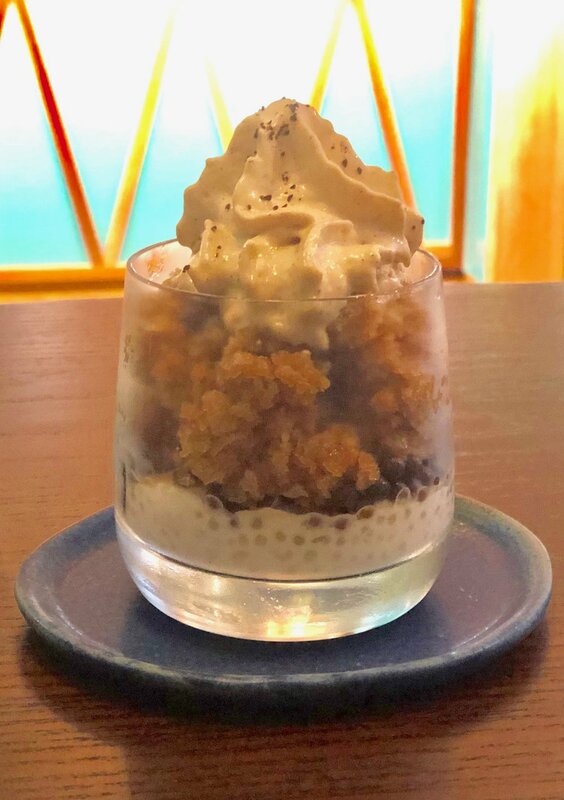 Lunch ended on a bright note, with the “Coffee & Cream Shave Ice,” with coffee jelly and tapioca. Basically a combination of my favorite flavors and textures! The menu groups the dishes into breads, cold mezze (small plates), hot mezze, and suhoon (large plates). We started out with a Mana’eesh flatbread topped with pumpkin and pomegranate seeds. Delicious! The bread was nicely blistered and airy. We also had a Hummus Kawarma, which was hummus topped with spiced lamb. Also good, but that spiced lamb was a bit tough like jerky. My favorite dish of the night was Maklouba. It was a vegetarian dish, with rice, topped with cooked potatoes and roasted eggplant, and potato chips on top! Hearty and indulgent and comforting, with a warming spice mixture intertwined throughout, I could eat this every day. 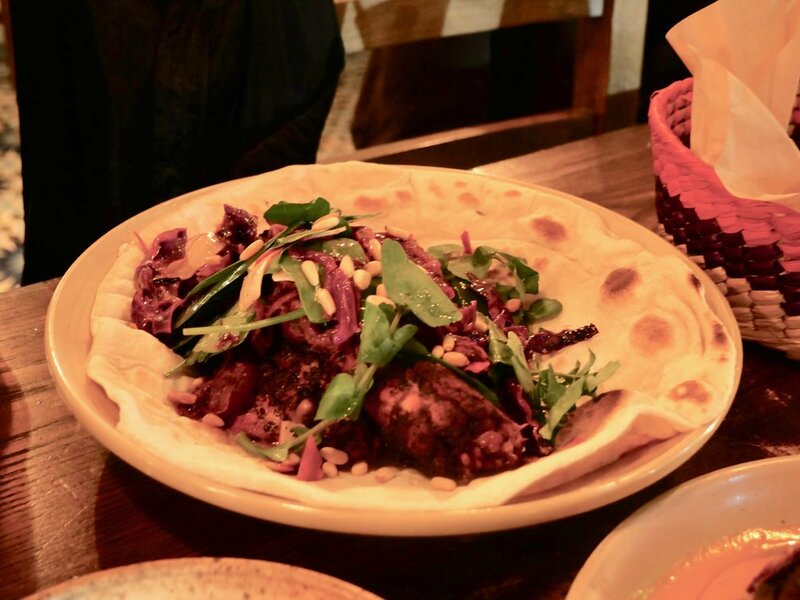 We also got the Musakhan, which was sumac-spiced chicken confit, served on a lavash and topped with some caramelized onions, pine nuts, and lettuce. The chicken was tender and flavorful, and was a good dish. Perhaps not as wow-ing as the stack of starch above! Dyafa isn’t particularly cheap: dinner ran about $40 per person. But that wasn’t as much as Trailblazer Tavern earlier in the day. Even with the cocktail being complimentary, the bill came out to be about $50 per person including tax and tip. So that is the other trend in San Francisco eating that I have definitely noticed over the years: it’s getting more and more pricey to eat out!